Now a days petrol engines are equipped with fuel injectors instead of carburetors which used to mix air and fuel and then send into combustion chamber. Actually Carburetors are used in automobiles from many decades as an equipment to mix the air fuel mixture and supply it to the intake manifold of engine. It is fitted in between the intake manifold and air filter.In petrol engines, air and fuel are mixed by carburetor and then sent into combustion chamber which is then ignited by spark plug.The problem with carburetor is that it is less efficient because it can not make mixture properly during varying driving conditions and at high altitudes.So,a technology was introduced that injects the fuel directly into combustion chamber like diesel engine and this mixture is ignited by spark plug.This technology is also known as GASOLINE DIRECT INJECTION. What are they and how it works,after knowing this,you will be able to find that why it is used more widely. FUEL INJECTORS will injects fuel directly to the engine without pre-mixing it with the air.This system is derived from the diesel engines which uses injectors to supply pressurized fuel more precisely to the engine for better combustion .And an engine equipped with GDI has ECU( Electronic Control Unit - like CPU in computers ) and various sensors.These sensors in the engine keeps an eye on various conditions of the engine like engine speed, temperature, load, intake air, exhaust air etc. After sensing all of them it injects the fuel as per engine requirements so that not any extra amount of fuel will come in and get wasted. It is giving less fuel when engine load is less and more fuel when engine load is more. Unlike the carburetor which is delivering the fuel with his mood ( sometimes more sometimes less) because it is not sensing any conditions. So fuel is wasted as well as engine is not working so efficiently. It is used generally to inject fuel more precisely and accurately as per engine requirements. *Based on all these sensors ECU calculates the fuel flow.There is a high pressure petrol/gasoline rail or line, which is connected with injector, so all the injectors have fuel at same pressure. *The fuel injection of gasoline takes place directly in individual cylinders of the engine and not in a common intake manifold as in case of MPFI. This improves the engine efficiency as well as the performance. *It is fairly obvious that most automobiles will be changing to fuel injection systems due to the lower emissions. *The fuel injection systems are the best as they will decrease vibration and help to overcome steep grades that are traditional terrain for off-roading. *Since fuel injection systems shoot fuel directly into the cylinders, they are easier to flood (too much fuel) when starting. 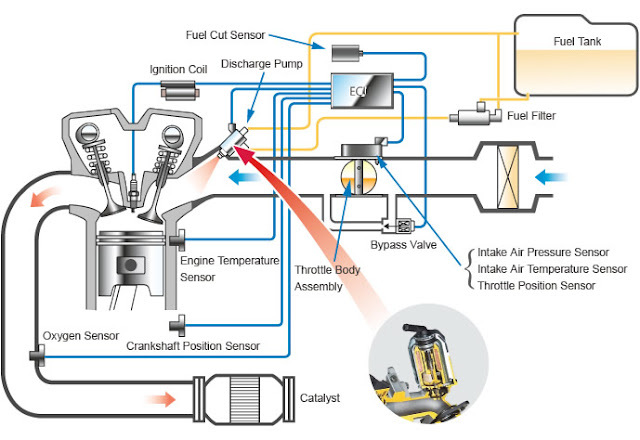 For this reason, starting procedures for fuel injected engines vary a good bit depending on the aircraft/engine combination. Carbureted engines undoubtedly take less talent to get started. *It results in complete combustion of fuel which results in low pollution and emissions.